What is assessment and how is it a cultural practice? 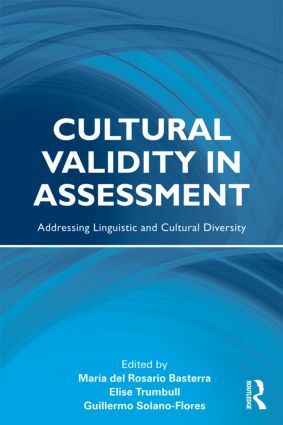 How does failure to account for linguistic and cultural variation among students jeopardize assessment validity? What is required to achieve cultural validity in assessment? This resource for practicing and prospective teachers – as well as others concerned with fair and valid assessment – provides a thorough grounding in relevant theory, research, and practice. The book lays out criteria for culturally valid assessment and recommends specific strategies that teachers can use to design and implement culturally valid classroom assessments. Assessment plays a powerful role in the process of education in the US and has a disproportionately negative impact on students who do not come from mainstream, middle-class backgrounds. Given the significance of testing in education today, cultural validity in assessment is an urgent issue facing educators. This book is essential reading for addressing this important, relevant topic. María del Rosario Basterra is Independent Educational Consultant, Washington, DC, specializing in issues related to English language learners, language minority students, multicultural education, and preschool education. Elise Trumbull is Independent Educational Consultant, Oakland, CA, specializing in issues related to language and culture in schooling, and Lecturer, California State University, Northridge, Department of Educational Psychology and Counseling. Guillermo Solano-Flores is Associate Professor, Bilingual Education and English as a Second Language, University of Colorado at Boulder.